From hotels to restaurants, water is the first thing guests order when they sit down to any meal. Just as with all food, people have their tastes and preferences when it comes to water. Sparkling or still? Tap or bottled? Their decision can impact your bottom line in two important ways: sustainability and profitability. Sustainability in restaurants and other foodservice operations becomes more important by the day. Energy consumption and food waste are two major components in achieving a more sustainable operation. Vero Water service addresses both. From production to transportation, imported bottled water requires up to 2,000 times more energy to deliver than Vero Water. It can take up to three times the amount of water to produce a plastic bottle as it does to fill. And filtration methods like reverse osmosis create nearly five times more water waste than drinking water. 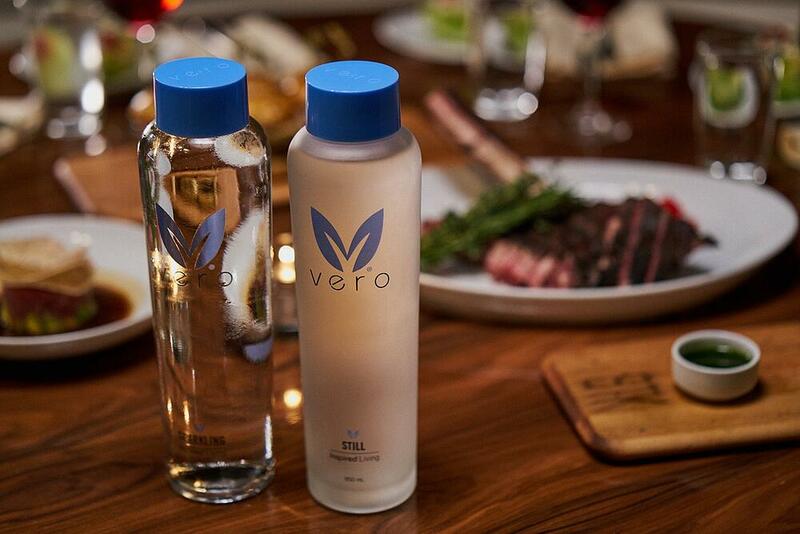 With Vero, water is purified, not wasted. After they’re used, glass and plastic bottles create 3 billion pounds of waste each year. Vero Water’s bottles are dishwasher safe and designed to be cleaned and reused over and over. Using the latest in purification technology, Vero Water’s bottling system is designed to create a nearly zero carbon footprint. And serving Vero’s water can be a crucial step toward achieving green certifications. As the leading consumed soft drink in the United States, bottled water should be a huge profit generator, right? A closer look at the numbers would tell you otherwise. In fact, 85% of consumers will choose tap water, rather than bottled water when they dine out. Why? The high price tag. The margins per bottle may look good when selling bottled water, but not when just 15% of your guests are paying for it. Vero Water provides a solution to increase the buy-in rate from the 85% of guests not willing to buy bottled water. With per guest and per table pricing strategies, consumers receive free refills of sparking and still water from Vero throughout the entire meal at a much more affordable rate than bottled water. If your foodservice operation currently sells bottled water at a higher rate than most, swapping in Vero Water will cut your operating costs per bottle in half, not to mention saving on storage space. With Vero Water, restaurants and other foodservice operations can start becoming profitable before guests even browse your menu. Get an interactive digital experience with Vero Water service. Check it out today, and learn more about the benefits of Vero.